This is an address you'll be glad to know in Akasaka, Tokyo. Located at just a 1-minute walk from exit 5 of Akasaka station, HACHIHACHI is a superb yakiniku (Japanese bbq) restaurant. The quality is undeniable as they only serve Wagyu (Japanese cattle), yet the price is still quite reasonable. It's really worth the go! I went to try it out, so here's what to expect. The first thing you'll notice when you walk in is the spacious stylish interior design. The place is really the perfect venue to spend a fun evening with friends. 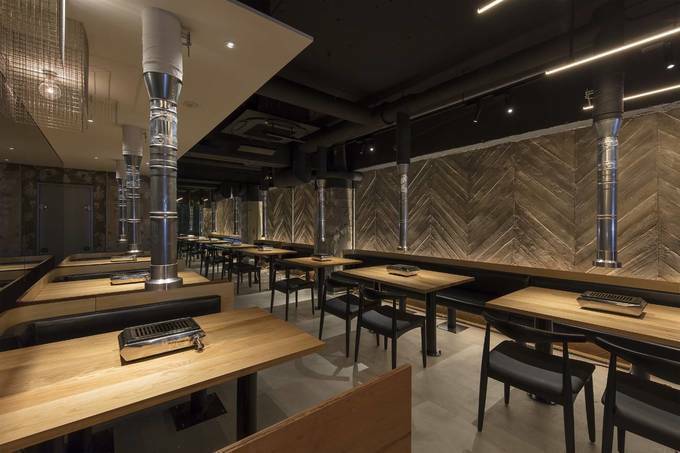 Of course, this is a yakiniku restaurant so burners are placed on the tables for you to grill your food by yourself. The self-grilling part is in my opinion half of the reason why yakiniku is so awesome! Another thing to mention is that they have many young university students as staff members with a good command of English. They'll go out of their way to make you feel welcome if you're a visitor to Japan. The other half of the reason to go is because of the succulent meat, and at HACHIHACHI, you won't be disappointed. 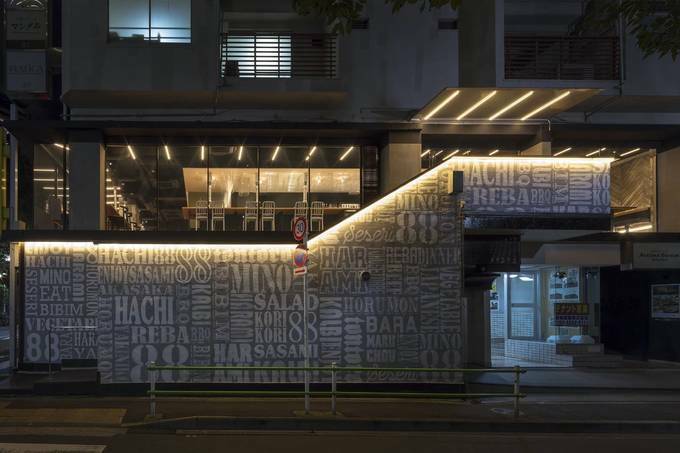 The restaurant specializes in Wagyu from Kyushu (the southernmost major island of Japan). A good start is this 5 Cut Premium Wagyu Assortment (¥2,000). You probably have heard of Kobe Beef, which is arguably the finest Wagyu there is. But let's be honest, not everyone has ¥20,000 to spare on a 200g steak. Alternatively, you can try this meat which presents some similar qualities but is just a fraction of the price of Kobe Beef. The Kyushu cattle here are raised with great care by the farmers and as a result, the meat has amazing marbling. Those streaks of fat are the reason why Wagyu is so tender. Since Wagyu is a bit on the oily side, you might want to have an order of fresh vegetables (¥680) too to balance out your meal. And yakiniku wouldn't be complete without kimchi. They have a nice assortment of three kinds for ¥780. On the left is the typical Chinese cabbage one, in the center are some super fresh and crispy cucumbers, and on the right are some daikon radishes. If you drink alcohol, I would argue that this is also a must! The restaurant is actually very particular about the wines it serves so they have a great selection that was thought out to pair well with the meat. The above picture is "kobore" Masu Sparkling Wine. Kobore means in Japanese "to overflow", so the staff will fill your glass until it spills over into the "masu" (traditional cubic cup). This is a traditional way of serving alcohol that was considered a sign of hospitality. This is a great choice! It went so well with the meat, but if sparkling wine isn't your thing, feel free to ask for other kinds of alcohol. They'll gladly recommend some pairings. Maybe it's just me who likes fire a bit too much but the meat grilling is the most fun part. You feel the warmth of the burner and you're busy turning the meat over while you chat. It's really nice. Be aware though that if you're cooking Wagyu, the pieces will cook in no time because of the high fat content. They might even catch on fire. People tend to overcook Wagyu, which is a shame because it's such fine quality meat that's best enjoyed not too cooked. Along with the meat comes a "tare" sauce. This is a soy-based sauce that you dip your grilled ingredients in. The original tare at HACHIHACHI is also a local product from Kyushu, and it was so good! The Wagyu pieces are simply exquisite. The Premium Assortment of 5 pieces that I ordered are from the same Kyushu cattle but are different cuts, so they vary a bit in texture and taste. To know precisely what you are eating, you can refer to the menu which has an explanation in English too. Generally speaking, the Wagyu was as expected really tender and juicy. The pieces just seem to melt in your mouth and the meat was packed with umami and a certain sweetness too. The tare sauce was the perfect match to this, enhancing a notch the savouriness. You can order salads too but it's nice to have vegetables on the grill. Just like the meat, enjoy them with the tare sauce. When your meat platter is served, they also provide you with a slice of lemon along with the tare sauce. For a change of taste, you can squeeze some lemon on your pieces and add a pinch of salt. After two pieces of meat with the tare sauce, I really enjoyed this different fresh flavouring. Once you're finished your first round of servings, you can reorder the cuts you liked the most in the assortment, or try something new like I did with this "shinshin" cut. Isn't it interesting how it is served to you folded to resemble a flower? Japan imported yakiniku style cuisine from Korea but made it its own. You can see this at HACHIHACHI in the aesthetic sense of the presentation. The shinshin cuts were served to me with some wasabi and soy sauce. You can ask for these condiments at any time, but they were recommended to me at this point to give another twist to the meat. It was a match made in heaven! I went so well with Wagyu. I personally love the distinctive fresh spiciness of wasabi and the pure taste of soy sauce. To finish the meal, I had the "ishiyaki bibimbap", a reliable classic to have with yakiniku cuisine. Ishiyaki means it's served piping hot in a stone bowl. Just pour in the sauce and mix well. I was explained that a key point to make this dish the best is to mix well and immediately spread the rice around the inside of the bowl. The bowl is so hot that it's still cooking the food. Wait a little bit so that a sort of crust forms. Then you can mix things up. This will give the bibimbap a really nice texture. This was the perfect way to end this meal. If you want to have a fun yakiniku experience and taste some excellent Japanese Wagyu from Kyushu that still is pretty affordable, I highly recommend this place! They're very particular about their wines as well, so their selection is much better than what you'd get at a yakiniku restaurant of comparable price. You get excellent value for your money for sure. If you're in Akasaka, make sure to give them a visit! The Best Kaiseki Restaurants in Tokyo! The Coolest Restaurants in Tokyo!